Inspired by our beautiful new printed vine corduroy in pink and green, we looked to Bonnie Blue Designs patterns for Autumn ideas, finding Charlotte #158 & Laurel #157! Having two complimenting colorways of this cute fabric made “sister dresses” come to mind immediately! ‘The Secret Garden’ started to come alive with beautiful gingham coordinates from Spechler Vogle & Fabrics Finders, Inc. The pink vine corduroy looked great with SV peppermint microcheck. Using Bonnie Blue Designs, “Charlotte”, we made a couple of quick variations: 1. Added a self-ruffle at the bottom of the sleeve, lined in microcheck to show a little “peek-a-boo” of gingham contrast. 2. Made a gingham spaghetti tie for the center front. 3. Added two sweet little oval pockets on the front. (Every child loves to hide treasures in pockets!) The pockets are lined in the microcheck, so when the top is folded down, the contrast shows. The flap has the little ribbon garland sewn around the edge & was decorated with a corduroy covered button. So, when you are in a hurry, have an idea, but no pattern….HOW do you find a good “oval shape”?? Looking all around the room, we found the perfect oval…the bottom of a tiny trashcan! It made the ideal sized pocket for this dress! Pattern shapes are everywhere, we just have to look with a “creative eye”. Ha! Green Vine corduroy was a great match to Fabric Finders Celery gingham. Using Bonnie Blue Designs’ dropped waist dress pattern, “Laurel”, we added celery gingham piping to the off-set collar, the bottom of the lined sleeves, and the bottom of the bodice. Also, using the gingham, we made a fabric bow to sew at the lower left side of the bodice at the skirt seam. A cute little button was added to the collar for embellishment. Now for the shoes… We looked to Amazon.com to help us prepare for their photo shoot. The pink corduroy need a softer touch and smaller shoe as to not overpower the little one. ‘The Doll Maker Flat Bootie’ looked like a great fit. For the green vine corduroy ‘Hanna Andersson Viktoria Girl’s Riding Boot’ was a great color match. Girls will be girls with twist & twirls in their new ‘Secret Garden’ dresses! “Jane”, “Charlotte” or “Kwik Sew Kutie”? “Jane, Charlotte, or Kwik Sew Kutie 3169” – Decisions, decisions, decisions…..
Do I really have to choose just one? These three peasant top patterns for children DO have their differences! I actually like to use all three of them – depending on the purpose of the garment. “Jane” by Children’s Corner Patterns and “Charlotte” by Bonnie Blue have been frequently the “go-to” patterns when making simple dresses, tops and nightgowns for the granddaughters. However, this week, I wanted to use a new Italian cotton with lycra – and because of the stretch in the fabric, I felt like it should be a little more fitted. So, taking a fresh look at the Kwik Sew 3169, I decided to give it a whirl. I liked using this pattern – lower front neckline, little puff sleeves, more fitted body – so made it 3 times in 3 days! This style pattern has unlimited possibilities, and each of these patterns offers something unique and special! “Jane“, by Children’s Corner Patterns, includes both a dress and top as well as cute pull-on slim, unlined pants with elastic back and front waistband. Seam allowances are 1/4”, and pattern is printed on tissue paper with each pattern piece printed separately. This comes in 2 size ranges: 1-3 or 4-6. “Charlotte”, by Bonnie Blue Designs, includes several versions for dresses and tops. Sleeve patterns included for flutter sleeve, short sleeve, and long sleeve. Pattern included for knit leggings in 3 lengths: Ankle, capri and shorts length with optional ruffles. Seam allowances are 3/8″. Pattern is printed on heavy paper, and it will be necessary to trace the pattern pieces. However, size ranges include 12 months through 8 years. “Kwik Sew Kutie #3169” includes two blouse versions and pattern for a patchwork pull-on A-line skirt. Seam allowances are 1/4″. Pattern is printed on heavy paper, and it will be necessary to trace the pattern pieces. Size range includes sizes 4-14 (XS, S, M, L, XL). White blouse (above left) is Italian cotton with lycra and is ideal for the Kwik Sew #3169 because the fabric has stretch and can have a comfortable closer fit. This is a very cute fabric with rows of pintucks! Green & white striped seersucker (above right) is also a cotton/lycra – and makes a very comfy little top and shorts. Love having these three patterns in my “sewing library” – quick, cute, easy, versatile!! Good for all shapes and sizes, too! What is a fabric bundle anyway? We have a few fabric suppliers that can somehow convince us that the limited space on our shelves should not be reflective of the amount of fabric that we should purchase… This puts us in the position to have to move a lot of fabrics quickly! Fabric Bundles are pre-cut fabrics, typically 3 yard quantities, that are pre-packaged and priced to move quickly. I think these fabrics are frequently “misunderstood”! Their quality equals or exceeds some of the finest fabrics that we carry. Their styles vary and if I were shopping at Farmhouse, I’d look there first. Here is our most recent seersucker fabric bundle: FB#19-SummerGreenSeersucker. 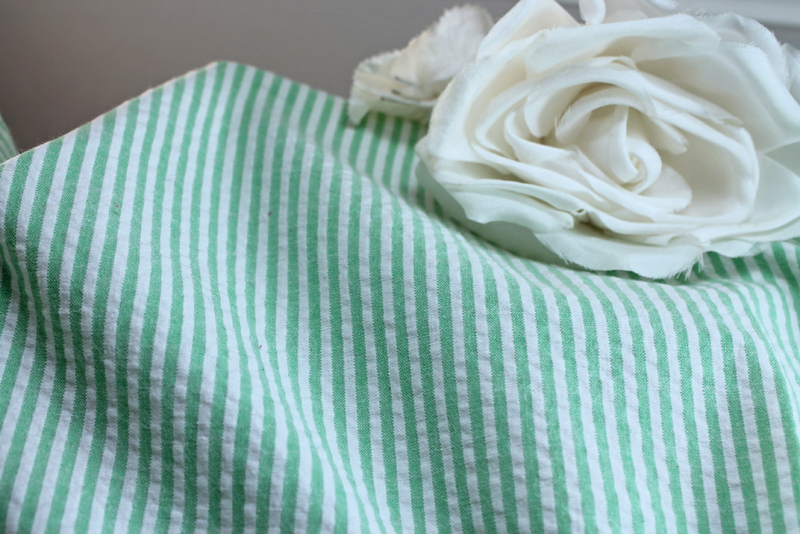 This is a beautiful summer green and white stripe seersucker (cotton with a touch of lycra) that is perfect for all sorts of projects. It arrived with about 100 other fabrics, and despite its beauty and the fact that I really like to see fabrics like this on the shelves of our store a little longer, it has to move. Because I really liked this piece, I started thinking of ways to use it. My little “ginger” looks really cute in this color & she and her sister look so precious in matching outfits! I really wanted to challenge myself with a fabric bundle and see what I could make from this pre-cut 2 yard piece. So I started with the “Janie Belle Jumper” by A Wink and a Nod Patterns. I added a beautiful white bias ruffle & sewed a sweet Swiss daisy trim on the attached bias to accent each ruffle. I had just a little fabric left to work with, so started on the “sassy little one’s” outfit! This time I needed to measure my fabric and see if it was enough for Kari Mecca’s “Melody’s Mermaid” pattern, which is becoming a summer staple! I laid out my fabric and it was a success – just enough fabric left over for a cute summer romper. To coordinate outfits for these sweet girls, I also used the white bias ruffle on the bottom of the romper and added the daisy Swiss trim for that “touch of sweetness”. This is a cotton seersucker with a touch of lycra, so I pre-washed & dried it before starting my project. I can say it washes beautifully! It has such a soft, comfortable hand before AND after washing! I wanted to try a couple more patterns with a scrap of this, so I cut a top from Kwik Sew #3169, and made a cute little vintage shorts pattern with turned-up cuff. (True confessions here: I started with a 3-yard piece of the seersucker, as most of our bundles have 3 yards included….). Since the last remaining piece was just a tad shorter than the top pattern, I pieced together a strip of the fabric from my scraps and added a ruffle. Perfect! Try these beautiful fabric bundles to challenge yourself to a ‘pattern-off’ and see how many outfits you can get from a discounted, pre-cut bundle! I love stashes, hoards, bundles & bulk! You never know what you’re gonna get. Sometimes things are an instant inspiration. Others are safely stored and wait patiently for a new life! As I was rummaging through my ‘seasoned’ goodies, I ran across a beautiful, but dated, Swiss collar. The Venice lace is timeless, and instead of returning it to its safe keeping, I pondered over the different ways to use it. The style is suited for a large, showy look that fits right in to catalogs from the late 80’s and early 90’s (bring on the big shoulder pads to go with it!!). Although it is a child’s collar, the length and width allows a lot more options if we think outside of the box. The lace is just too pretty NOT to use in some manner. We recently received some gorgeous and uniquely styled 100% linen fabrics. The one that immediately matched the look of the white Swiss lace collar was a cornflower blue and white gingham linen. The collar would work perfectly as straps on a sweet sundress pattern! Bonnie Blue Designs #160″Kimberly” was just the look I was going for! The picture of the blue and white gingham dress is shown at the top of the page. Here is another view. Since we loved this look, we wanted to try it again in another colorway. To recreate the dress, we went with a chambray ‘Petals of Pink’ linen. The chambray fabrics really come to life with this white Swiss Venice Collar! So now, onto the fun part… Construction! 1. Using “Kimberly” by Bonnie Blue Designs, cut front and back bodice from pink linen, white lining, and lightweight fusible interfacing! 2. Fully interface bodice front and back pattern pieces with German cotton batiste interfacing or French baby interfacing for stability. 3. Sew the lining to the front yoke, right sides together. Stitch armhole and across the top of the bodice/yoke piece. Trim seams, clip armhole curves. Turn right side out & press. 4. Sew lining to back yoke pieces, right sides together. Stitch armhole curve, pivot at top of the yoke, stitch about 1/2″ or so, backstitch. Leave opening approximately 1 1/2″ to insert back of collar/strap, begin stitching again across the top of the back yoke, pivot and stitch down center back seam. Trim seams, clip curves, turn right side out and press. 5. First try for me was placing the top on a mannequin and pinning the collar/straps in place. Luckily, I was able to fit this to a granddaughter before final sewing, but if you don’t have a handy-dandy child at your fingertips, just measure the length of the strap pattern piece provided in the pattern & start from there. 6. Once the front collar is placed and pinned, you will be able to make length adjustments in the back (this is a long collar). Mark the placement with a wash-away marker. The front collar may be then stitched in place by stitching around the outer edge of the collar. I used a Sewline Glue Pen to glue my front straps in place, so they wouldn’t shift while I sewed them. 8. Sew the front and back bodices at the side seams, press seams open. Tada!! Just add the skirt, and you have a darling dress!! 9. Here is the most amazing part. WHO in their right mind makes linen dresses for kids? Well, we love linen around here, and it is so cool and comfy in these hot South Carolina summers. The blue and white linen dress will be in our upcoming ad in Classic Sewing Magazine – and, following the photo shoot, we rewarded the kids with an Ice Cream Party! That meant chocolate, strawberry and vanilla all over the clothes, of course. I doused the stains with Shout, threw the clothes in the washer, shook them a little by hand, and hung them to dry. ALMOST NO WRINKLES! What fun these little ones had! Here is an outtake from our upcoming Summer 2017 Classic Sewing Magazine photo shoot & Ice Cream Party!! For all of our bloggers out there, use coupon code IceCream15 to receive a one time 15% OFF coupon code on your next order! Don’t Stretch the Elastic – Decorative Elastic Waistbands! Decorative Elastic is such a pretty way to finish the waist of a garment! The quality is easy to see when it’s used as the waistband of your pants, shorts or skirts! At Farmhouse Fabrics, we use it frequently – and it is such an easy finish! There are a couple of “tricks” to apply it – we often have questions about the “hows”…because it is such a pain to attempt to stretch it to fit the garment! This is a firm elastic & who wants to break needles by trying to stretch and sew the elastic at the same time? But sewing doesn’t get much easier than when using a decorative elastic waistband! With just 2 measurements, we have designed a skirt “pattern” that we call a “Decorative Elastic Skirt”! We use a 1 1/2″ wide thick and sturdy elastic that comes in a wonderful range of colors. Measure your child’s waist and add 1″ – this is the length of your decorative elastic. Measure your child’s finished skirt length and add 1 1/2″ – this will account for a hem allowance. Cut the waistband decorative elastic to the determined waist measurement (plus 1″ for the back seam). Serge the top and bottom of the skirt fabric to finish the edges. Run two rows of gathering threads on one long end of your fabric (the top of the skirt). Quarter fabric and elastic – mark with washable pen. Match up your quarter marks between fabric & elastic and pin at marks. Now, you can remove the gathering threads, and the zig-zagged elastic will stretch with your child! No broken threads! Center back seam – With right sides together, match the decorative elastic, carefully match the elastic and bottom of skirt, pin into place, and sew the back seam. This seam may be serged, if desired. Press up hem 1 1/4″ deep to your finished length – pin & hem! Voila! A fast & easy skirt with not a single broken needle on stretched elastic! For pre-coordinated decorative elastic kits, visit our Kits, Skirts category! It is a lot of fun to make these little skirts using left-overs from other projects! Honestly – sometimes a third of a yard of fabric will make a skirt. Adding a row of trim, ribbon, rick-rack, etc. to the hem will jazz it up a little, too. Have Fun!! Children’s Corner ‘Lillian’ has been a staple dress that we just can’t get enough of! It’s simply classic and easy to embellish or just as well left plain. But how do you attach lovely straight edged taffeta, jacquard, grosgrain or satin ribbons to a curved skirt? Lillian is so well suited for 3 graduated rows of ribbon – but ribbons that aren’t suited for a curved line in a skirt! I refused to hand baste a gathering thread to each row of ribbon, so I didn’t make the dress for 15 years! 15 years ago, on a fabric buying NY trip, I was inspired by a sweet, simple and classic little dress. It has been in the back of my mind for all of this time, believe it or not! Classic clothes never seem to go out of style, do they? The dress that so inspired me was white, sleeveless, simple – with 3 rows of graduated width red and white striped grosgrain ribbon sewn above the hemline. Each row had a little flat bow sewn to the left of the center front. Over the years, I stocked the ribbons in various colors – but never made the dress. Now that there are young ladies around here to actually wear the garments that float around in my mind, I am inspired to put the dreams into action. So – the ribbons don’t HAVE to be grosgrain stripes! Pink and white taffeta gingham ribbons would be perfectly pretty! ….I love to watch technique teachers. They have a way of making the hardest exercises look effortless or using a notion that ‘cuts corners’ to simplify a difficult process. Time lapsed and one day I watched as Cindy Foose casually used this simple “scrunch” method to slightly ease a pattern piece. Not much ease was needed to follow the slight curve of the skirt of “Lillian”, but a curve was definitely important. Holding my index finger behind the presser foot, I sewed along the edge of the ribbon, letting the ribbon scrunch-bunch between the presser foot and my finger. That created just enough ease to make the necessary curve to fit the skirt shape! You can see in the picture below on the right the difference between the straight ribbon and the slightly curved ribbon. Measuring up from the hem, I marked the first line for the bottom ribbon placement, pinned it in place (or – you could use a Sewline Glue Pen, recommended by Connie Palmer, to glue it in place), and sewed my first row. I measured between each row, one at a time, sewed in place, giving equal distances of space between each row. 1. Find the center of the “bow” ribbon & place the center perpendicular to the sewn row of ribbon, and sew across the ribbon horizontally – left to right – (this will look like a cross). The ribbon will be going up and down… and it will seem weird! 2. Tie the bow normally, and the bow will be in perfect position! 3. Trim ends to desired length. 4. We played with the bow placement, and decided we preferred the off-set placement the best. Thanks ladies for these tips and so many others! Darn It! – Accidents Happen – Really, Darn It! As preparations were being made for a sisters Christmas photo shoot, we quickly gravitated to our vintage-inspired dress with 3/4 length sleeves made in a very lightweight wool, Soft Mauve – Pink Jacquard fabric….. With a gentle tug of excitement to pull this lovely dress from the clothes-rack, our ears were pricked by the horrible sounds of a tear! Sure enough – there was a hole, front and center! Pretty hard to hide this one in pictures! Gosh darn, golly geeze, son of a… wait a minute – Darn It! Really, Darn It! All the thinking caps went on – how in the world to repair a hole in this sweet wool dress? “Darn it!” Darn definition: To mend, as torn clothing, with rows of stitches, sometimes by crossing and interweaving rows to span a gap. However, before a thread was stitched, trial efforts were made! Instead of making my initial attempt on the dress itself, I took a seam ripper to a remnant swatch of our gorgeous wool – intentionally adding a hole to see the best way to repair it. To fuse the dress with a self-fabric patch, I used ‘Stitch Witchery’. ‘Stitch Witchery’is a great tool for hems, trims, belts and so much more! Here, ‘Stitch Witchery’ fused my man-made hole with a repair patch. – Place a pressing cloth over the wool to fuse the patches together. This fabric is such a unique color and when a thread match was seemingly impossible, I grabbed a small remnant of the same wool fabric and unraveled a thread that be could used for an exact match! After fusing a small piece of the same wool to the back side of the garment, I used the threads shown below to “darn it”!! It really worked! *Please don’t let my husband know I actually “darned” something! For our 44 years of marriage, he has been asking me to darn his socks!! I can easily throw away his socks, but I just had to rescue the dress! Priorities, right? To check out the full photo shoot video, click the picture below! Certain fabrics are so inspiring and sometimes can be a little intimidating. They often catch our eye while perusing for a new inspiration and then later are returned to the shelf when their beauty or uniqueness overshadows our imaginations. And then on some bright morning, we pair a lovely fabric with a well suited pattern. But what happens when you you lay out that beautiful piece of fabric on its pattern equivalent and it’s still not perfect… Sometimes just a small change makes all the difference. Just by altering the neckline shape of this pattern, it helped suffice that small twinge that something just didn’t feel right! Follow our step-by-step instructions to lay out a new neckline on the classic and sweet Children’s Corner Pattern ‘Lillian’ #230 with this beautiful tucked Swiss cotton fabric. Always one of our favorites – but so hard to picture how to use the pre-tucked design that is laid out in a “panel” pattern on the fabric. Somehow the design had to be utilized – as it is so beautiful and unusual. In the picture on the left below, the underarm point on the front and back side pattern piece is shown here positioned at the same white tuck on the fabric. The picture below on the right shows the hemlines matching the same tuck. This will ensure that the stripes/tucks will match all the way down the side seams. Next Step: Trace the front of the dress pattern (neckline, shoulder line, armhole, center front) on tracing paper. Using a clear ruler, draw a line from the center front, starting just at the seamline – Line needs to be perpendicular to the straight of the grain. And there you go! A sweet square neckline on your Lillian jumper! Can I tell you something? In the end, I felt like the square neckline was actually a little too wide, but because I am always in too much of a hurry to cut a “muslin”, I went with it! Next time, I would actually angle the line from the shoulder seam a little more towards the center front! True confessions!! We wanted to do a bit of a “fitting” with these two girls but they had other plans in mind! 25 years of piling fabric remnants creates a FABRIC MOUNTAIN that “could” be dangerous! Always thinking that if the end of a bolt of fabric was safely stored in some organized manner that would be useful in planning projects, filling orders, and creating kits – the mountain of fabric remnants quickly became a “mountain range”. The “special” remnants (Liberty of London, Swiss voile, etc.) are often found hidden in “Sally’s Corner” – but when the paths become too narrow, and the employees are threatening to call “Hoarders”, she grabs her heart & cries, “Mutiny!”…. The only workable solution – “Share the Love”!! “Let It Go”, the song from the movie, “Frozen”, has taken on a whole new meaning at Farmhouse Fabrics. Fabric, trims, and even our gorgeous laces are being passed along at a 30% discount! Whether you need a short piece of pique to use for a collar, an embroidered Swiss batiste for a baby dress, a Christmas fabric for decorations, or fine laces for an heirloom project, you might just find it in any of the following specific remnant categories: ginghams, Swiss and heirloom fabrics, holiday fabrics, and our general remnants section. A doll outfit like this could easily be made using our remnants! Visit the trims remnant category to find gorgeous embroidered ribbons, embellished French trims, and much more! The same goes for lace. You can find lovely lace pieces in the lace remnant category-anything from Maline to Cluny. These short pieces are ideal for a neckline or for around sleeves-instances where you don’t necessarily need to buy a whole yard (although, often, there are pieces with yardage). And again, these trims and laces are always discounted 30% ! To each of you who have purchased a portion of our “Farmhouse Fabrics’ Remnant Mountain Range”, we thank you!